I hate Robin Williams. I always have. I thought he was obnoxious on Mork and Mindy, and he’s gone downhill from there. I find his comedy spastic and grating and his dramatic efforts earnest and maudlin. His movies have made me physically ill; I developed such a severe headache watching Mrs. Doubtfire I almost walked out. I haven’t even bothered seeing most of his recent offerings. With choices like Bicentennial Man and Death to Smoochy, why bother? I only tell you this to ensure you sufficiently understand just how good a Robin Williams film would have to be in order for me to recommend it. 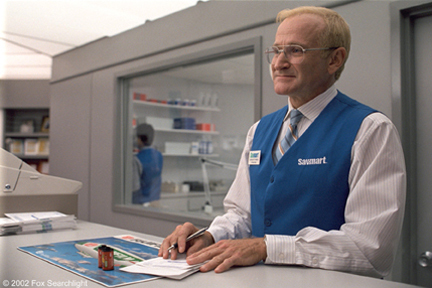 And, incredibly, One Hour Photo is precisely that good. Even as I write this I can’t believe what I’m saying: you don’t want to miss this movie, it’s one of the summer’s best. To his credit, Williams gives a terrifically subdued performance, disappearing completely into the role of Sy, a lonely clerk at a photo-processing counter. Sy’s world is eerily antiseptic, from the clinically white environs of the discount store where he works to the sterile rooms of his own apartment. But we know he’s truly creepy by the garish yellow tint of his peroxided hair. For further proof, there’s the wall of photos in his living room depicting, in chronological order, nine years in the life of the Yorkin family – Nina (Connie Nielsen), Will (Michael Vartan) and their son, Jake (Dylan Smith). Through years of processing their film, Sy has developed a fixation on the family, and, unbeknownst to them, has quietly adopted them as his own. The depth of Sy’s obsession is revealed though a series of increasingly unnerving scenes. Yet even as Sy’s more disturbing tendencies are exposed, he remains a strangely sympathetic character, making his behavior all the more difficult to watch. Sy’s exchanges with Nina and Will, always stilted, become painfully uncomfortable. Worse, his interactions with Jake take on a sinister, pedophilic overtone guaranteed to make you squirm in your seat. Writer/director Mark Romanek, known primarily for his music videos, makes good use of the stylization, symbolism and imagery he’s employed in clips for everyone from Madonna to Nine Inch Nails. Colors bleed and saturate scenes, giving them the look of an exposed negative. Surreal, dreamlike visuals lend much of the action an otherworldly quality, all the while maintaining an unsettling realism. Tragic and terrifying, One Hour Photo isn’t a thriller in the traditional sense, but it’s sure to give you goosebumps just the same.